VIP unlocks at VIP Lv. 1. All buildings require gold to be upgraded, but you will receive gold from quest completions on them. Town Hall Level 02: Shop added to your town. Cottage #2 added. Town Hall Level 05: World & Local View Unlocked. Town Hall Level 11: Tech Center added to your town. Bless & Tavern becomes available in Train Center. Town Hall Level 12: Market added to your town. Town Hall Level 36: You will use Battle Orders if you lose the battle. Town Hall Level 40: Daily Quests become available. Town Hall Level 41: Merchant Guild added to your town. Town Hall Level 41: You may send out trade caravans. Town Hall Level 45: Bank added to your town. Town Hall Level 82: Smelting forge added to your town. Town Hall Level 85: 2nd Training Ground. Collect Taxes, Promotion and follower(s). Tax collection is one way of building up your gold reserves. You will get the basic 12 tax collections per day but you may also recieve bonus tax collections from Seasons and from Government Decisions. The amount of tax you collect depends ony a number of things as follows. The amount of Cottages and their level, Magistrate level, Area Prosperity, Citizens Loyalty and Alliance Tax Tech Level. Your Citizens Loyalty will drop 1 point for every tax collection you make. During tax collections, you will some times be given a chance to recieve extra gold or to raise your citizens loyalty by making a Government Decision. This is in the form of a question and 2 possible answers. One of the answers will give you extra gold and the other will raise your citizens loyalty by 6 to 9 points. One or two of these will also give a bonus tax collection as well as gold or loyalty. Promotions are achieved by gaining Prestige. They will give you larger salaries which can be collected once per day. They also give extra hero slots on certain levels. For a complete guide to promotions, go to the Prestiege Page. The Armoury is where you recruit or draft troops. If you look at your info panel top left, you will see Troops ?????/????? this shows the troops you have and the maximum troops you can recruit. You need to keep an eye on this and recruit more troops as it goes down. You will need grain to recruit troops. If you let it get too low, you will go into battle without your full troop numbers and it could result in a loss for you and maybe even your team mates if your attacking MPA's. Providing you keep this topped up, your trops will be added to your hero automatically. Drafting Troops allows you to recruit a small number of troops without using grain. Recruiting troops only adds troops to the hero's in the current default formation. Smelting Forge is added when your town hall reaches level 82, your smelting forge must also be level 82 before you can begin forging. There is also a forging level, this can only be upgraded by upgrading your Alchemist level to level 82+. Level 83 Alchemist and Forge will allow you to forge at level 2 once you have gained enough forging experience, so its important to keep your Alchemist and forge level upgraded enough to allow for the next forging level to take place. This is where your hero training is done. If you enter the training grounds you will see the upgrade button and 3 other buttons, Train, Bless and Tavern. Clicking the training button will open the following screen. At the top right you will see Training Slots: ?/?. This is the amount of heroes currently in training / and the maximum heroes you can train at one time. On the left are your currently recruited heroes. The amount of heroes you can recruit at one time will depend on your Promotion level(Rank).Top right you will see the currently selected hero's information. The hero's name and current level are at the top. Below this the current amount of troops this hero commands and / the maximum amount of troops the hero can command. Use the Armoury to recruit troops if these two numbers do not match to make sure you go into battle with the full compliment of troops. Below this your hero's Stats/Attributes. P: is the hero's Physical strength, T: is the hero's Technique strength and M: is the hero's Magic strength. Below this is your hero's Rank. Hero Ranks are the same as item levels. At hero level 1, the heros rank will be Bronze 1. The only exception to this is if your hero has been Reincarnated. Below this is your hero's Technique, but not all heros have a Technique. If you position the mouse button over the hero's technique, it will give information on that particular technique. Below the hero's portrait is the Hero Speciality, in this case Adepts. Positioning your mouse over this will give you infomation on their particular Speciality. You will see 3 buttons next to the hero's information, Release, Add Slot and Training. The Release button allows you to release the selected hero, doing this frees up a hero spot and sends your released hero back to the hero recruiting area and allows you to recruit another hero to train or fight. You do not lose the released hero but you will have to pay the hire cost to put him/her back in your recruited line up. The Add slot button allows you to purchase a hero slot using Celest. The amount of slots you can purchase is limited. 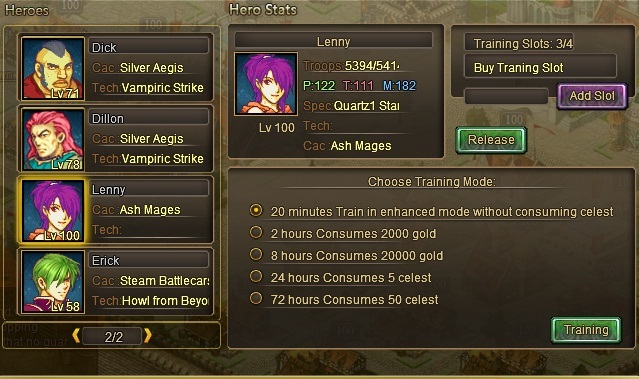 Depending on your VIP level there are a number of training option to choose from, which will determine the amount of time your hero trains for. Select the one you want to use and click Start Training. Training will start on your currently selected hero. You will then see another panel with further options to speed up training. Image to follow. A second training ground is added at TH level 85. This second training ground will increase the amount of experience your heros get per hour. When both training grounds are at the same level the experience gained is doubled. Again depending on your VIP level, you will see a number of options to speed up your hero training. Technology Center(TC) This is where you will upgrade all the Technologies your hero's, troops and city uses. More technologies are added as they and your TC get upgraded. When you open the shop you will see the upgrade button and 4 other buttons, Purchase, Enhance, Storage and Treasure Hunt. Clicking the purchase button will take you into the shop where you will see whats on offer to you. This is where you may pay gold & hunt for mounts or cloaks. The more skilled the hunter the better grade items can be found. The free hunt can be done once per day.